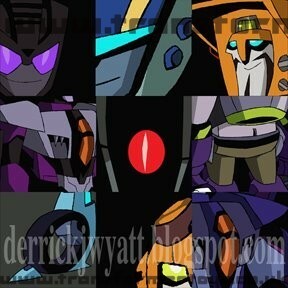 Derrick Wyatt has updated his blog with a preview images of some of the Transformers Animated characters which should make an appear in the cartoon series in Seasons 2 and 3. The images appear to be off Swindle, Jetstorm, Wreck-Gar, Skywarp, Shockwave, Mixmaster, Blurr, Jetfire and Thundercracker. "About Gurren Lagann: No, actually. I hadn't seen Gurren Lagann until after we had finished most of the first season of TFA. I wish I had, because I would have had the Headmaster robot transform with stubby little legs. And maybe Masterson's head popping up out of the top of the robot." "About the inspiration and influences on TFA: I'm always inspired by Gainax's designs. They are by far my favorite animation studio in the world. I just hadn't seen anything on Gurren Lagann when we started TFA. We've definitely been inspired by that and Diebuster since. Prowl and Soundwave's glasses are a nod to 2000 AD's ABC Warriors. That and Mighty Orbots were the biggest influences on the designs. As for Shockwave: There is a reason for his color change, but I can't explain that now. I do hope to get him repainted to his normal colors somewhere down the road. " "About the Seekers: You go right ahead and dream, you never know what could happen. Mumbo: I DID design the Amazing Mumbo, he was my favorite character from Titans. If you scroll way back through this blog you will find some drawings of him. Good times! Same thing with the Transformers sketches, there are some a few posts down from this one. I am always doodling other characters I want to put in the show. Some may even show up! Curse you Bigbot.com for your daily ebay rarities! (J/K!) I have to look through those things obsessively every day, and I can never afford them!"